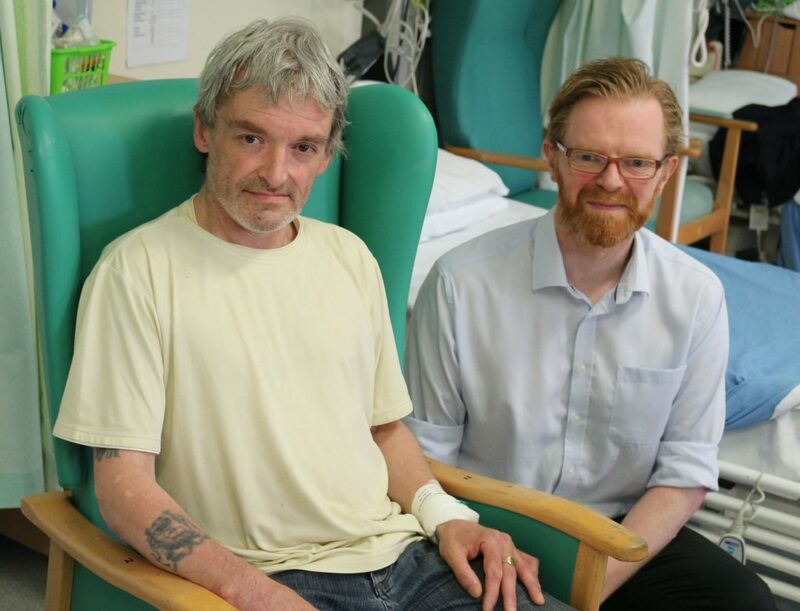 A former labourer who thought he was dying is now on the road to recovery thanks to a pioneering procedure which has just become available to Bradford patients. Brendan Wainwright, 54, from Silsden, was rushed to Bradford Royal Infirmary’s (BRI) Accident and Emergency department on Monday, June 4, after experiencing a life-threatening stroke. Just two-and-a-half hours after arriving at the hospital, part of Bradford Teaching Hospitals NHS Foundation Trust, and after receiving clot-busting drugs following an emergency CT scan, he was blue-lighted to Leeds General Infirmary (LGI) for a life-saving procedure called mechanical thrombectomy. The new service is unique in the UK for being able to treat a patient for a stroke and discharge them back to their referring hospital the same day, all thanks to a highly co-ordinated approach between stroke nurses, interventional neuroradiologists, consultants, and other practitioners, which aims to treat the incoming patient as soon as possible. The advanced emergency treatment allows clots to be removed from the brain by a neuroradiologist, and can significantly decrease the risk of long-term disability and save millions of pounds in long-term health and social costs. If used within the first six hours of symptoms beginning to show – alongside other specialist medical treatment and care – the procedure can significantly improve the chances of disability-free survival by restoring blood flow and limiting brain damage in inpatients. NHS England gave the go-head to commission the new service in April this year and last month Bradford patients, along with other hospitals across the region, were able to access the procedure at Leeds for the first time. Mr Wainwright is believed to be the first person in the country to have been admitted to his home hospital, moved to the regional centre for this innovative, new procedure and then repatriated back to his local hospital on the same day – in his case within just nine hours. Mr Wainwright, who is registered disabled and lives alone, said his symptoms first started around 11.30am when he experienced pins and needles in his legs. He continued: “I tried standing up but fell over and then it started getting worse. It got to about 12.05pm and I dialled 999 and asked them to send an ambulance straightway, as I knew something was seriously wrong. “By the time I got to A&E I thought I was dying. They pumped drugs into me and when I saw the serious look on the doctor’s face I got really scared when he said they were sending me to LGI. “By that stage my speech had gone and I was completely paralysed down the whole of my right side. It was the scariest thing I have ever experienced. I thought I was going to die. “I was rushed straight to Leeds where a bed was already waiting for me. I went straight onto the bed, into the scanner and then straight into the operating theatre. By that evening, Mr Wainwright was deemed well enough to be transferred back to Bradford Royal Infirmary. The following day (Tuesday, 5 June), doctors found he had made a near full recovery, although he was still experiencing some slurred speech. A CT scan that afternoon showed the clot had gone. 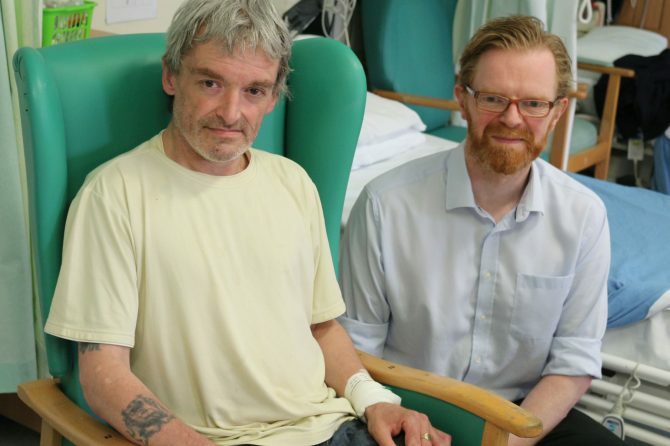 On Wednesday, 6 June, his consultant stroke physician, Dr Stuart Maguire, based at Bradford Teaching Hospitals NHS Foundation Trust, deemed him medically fit and Mr Wainwright was discharged home. Dr Maguire said: “I am delighted that we have been able to demonstrate that the pathway which allows our patients to access this innovative treatment in Leeds is working well. “I am delighted for Brendan because he has received a fast service that has limited the effects of the stroke and we have been able to get him home in the best possible fitness just 48 hours after he had signs of a significant, disabling stroke. For every minute wasted two million nerve cells in the brain die. Dr Maguire added: “Strokes display a wide range of symptoms and the sooner that someone is seen by a specialist, the sooner they can receive treatment. Mr Wainwright said he was delighted to have been Bradford’s first patient to access the new service. He said: “My memory is still a bit foggy but then it always has been. It’s unbelievable though – I got to the hospital just in the nick of time. I now feel on top of the world and feel very, very lucky. The Regional Mechanical Thrombectomy Service, which was commissioned by NHS England in April this year, is based in Leeds but caters for patients across West Yorkshire and Harrogate who urgently require the procedure to remove a stroke-causing blood clot. The Brain Attack Team at Leeds Teaching Hospitals NHS Trust (LTHT) provides specialist treatment for patients from across the region. Alastair Bailey, Lead Nurse for Stroke at LTHT, said: “A mechanical thrombectomy works in a similar way to using plumbing rods to dislodge a drain blockage – the procedure clears the artery of the clot and restores blood flow to the brain. For patients who have a blood clot that drugs cannot remove, it is vital this takes place as soon as possible. “What makes this service unique is in its co-ordination. Here, our Brain Attack Team (BAT) nurses co-ordinate a bespoke service, taking the initial call from the referring hospital and coordinating the whole process. “A BAT nurse will meet the patient straight from the ambulance and accompany them every step of the way through the process, providing a one-to-one pathway of care. This is, of course, a huge team effort, but that one nurse brings together the entire operation, lending a consistent presence to the patient’s care. Dr Tony Goddard, consultant neuroradiologist at LTHT, said: “The amazing success for this patient is a culmination of months and even years of planning and a testament to the collaboration of an incredible team of experts. A lot of hard work went in to get this right. Mr Wainwright’s symptoms started around 11.30am on Monday, 4 June. He called an ambulance around 12.05am. He arrived at BRI’s A&E department at 12.57pm. He underwent a CT scan at 1.25pm and was thrombolysed in A&E shortly after. Around 3.30pm Mr Wainwright was transferred by emergency ambulance to Leeds for a mechanical thrombectomy at LGI. He was rushed into the radiology catheter lab at LGI where the mechanical thrombectomy was performed under general anaesthesia by a consultant neuroradiologist. He arrived back at BRI at 8.37pm that evening. On Tuesday, 5 June, he was deemed to have made a near full recovery by medics (he was still experiencing some slurred speech), and had a repeat CT scan on Tuesday afternoon which showed the clot had gone. On Wednesday, 6 June, he was deemed to be medically fit and discharged.